WFPC 3 shaking in its boots, awaiting cosmic radiation in the bowels of the Space Environment Simulator. Its crown scrapes the 30-foot ceiling of the I&T facility; there's another 30 feet of it underground, 10 feet of chamber and twenty feet of foundation capable of supporting 4,000 pounds. Scientists gingerly lower space-destined equipment, such as a new satellite, into the UFO-like structure. Then they close the door and, or so I'd assume, press the big red button labeled "SPACE," which turns on the high vacuum, chilly (-310 F°) or blazing (340°) temperatures, and even cosmic radiation, high-energy protons, neutrons, and nuclei. 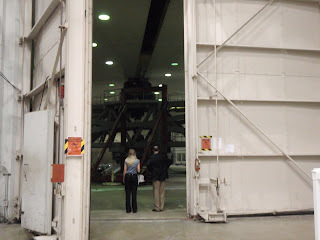 Just beyond these massive doors lies the centrifuge. The 120-foot-long rotating arm can spin up at up to 33 RPM and generate up to 30 Gs of acceleration. Aleya jokes that it's Goddard's biggest storage closet; at the moment the floor is cluttered with mysterious equipment, but just a few months ago the new Hubble camera, the Wide Field and Planetary Camera 3, was put through its paces here. But this is not a training ground for astronauts; 30 Gs is far beyond what the human body can withstand. "It takes about a gigavolt to start it up," Aleya says. Thats a thousand million volts. Phew. Wonder if the neighbors notice. 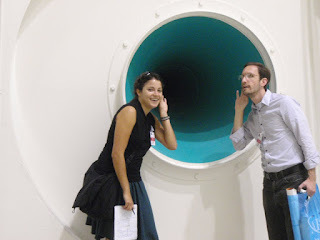 One of the Acoustics Chamber's 42 foot walls is one massive subwoofer, the world's biggest. Each speaker is 6 feet tall. The tweeter, on the other side of the room, is big enough to crawl into. Like everything else at the I&T facility, this feels like something designed by a giant. It's here because space scientists really do have to think of everything. Equipment that goes to space has to endure incredible hardships, including the deafening roar of launch. If you were unfortunate enough to be caught inside this room once the iron doors slowly swing shut, it would be like standing right under a rocket during lift-off. 150 decibels, baby. ...and here's the tweeter. Moments later we recreated the RCA logo. "Rumor has it that the paint peels off, but I've never seen them repainting," says Aleya. 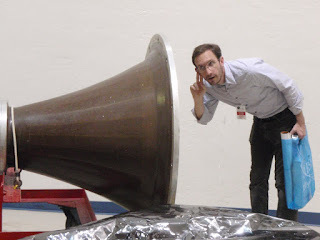 If you enjoyed our mini-tour of Goddard, you have to watch this grunge music-infused NASA video chronicling WFPC 3's trial by fire through the I&T facility's series of escalating "tortures." 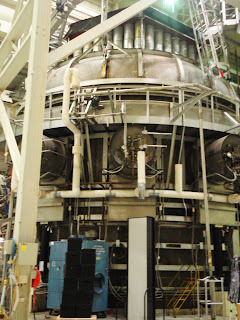 You'll see the acoustics chamber and centrifuge in action, and watch the massive hatch close over the Space Environment Simulator. Special thanks to Aleya Van Doren for taking us on this tour of Goddard. If you're an educator or a student, check out her outreach page for ways to use NASA SDO materials in the classroom.